- in the case of a serious impact, the airbags are triggered instantly and protect the occupants of the vehicle (with the exception of the rear centre passenger); immediately after the impact, the airbags defl ate rapidly so that they do not hinder visibility or the exit of the occupants, - in the case of a minor or rear impact or in certain roll-over conditions, the airbags will not be triggered; the seat belt alone is suffi cient to provide optimum protection in these situations. This equipment will only operate once. 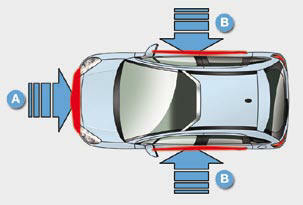 If a second impact occurs (during the same or a subsequent accident), the airbag will not operate. Triggering of the airbag(s) is accompanied by a slight emission of harmless smoke and a noise, due to the activation of the pyrotechnic cartridge incorporated in the system. System which protects the driver and front passenger in the event of a serious front impact in order to limit the risk of injury to the head and chest. The driver's airbag is incorporated in the centre of the steering wheel; the front passenger's airbag is incorporated in the dashboard above the glove box. The airbags are triggered simultaneously, unless the passenger's front airbag is disarmed, in the event of a serious front impact applied to all or part of the front impact zone A , in the longitudinal centreline of the vehicle on a horizontal plane and directed from the front to the rear of the vehicle. The front airbag infl ates between the front occupant of the vehicle and the dashboard to cushion their forward movement. then, remove the key keeping the switch in this position. This warning lamp comes on in the instrument panel when the ignition is on and until the airbag is re-activated. To guarantee the safety of your child, it is imperative that the passenger's front airbag is disarmed when you install a "rear facing" child seat on the front passenger seat. Otherwise, the child would risk being seriously injured or killed if the airbag were triggered. When you remove the child seat, turn switch 1 to the "ON" position to reactivate the airbag and so assure the safety of your front passenger in the event of an impact. With the ignition on, this warning lamp comes on in the instrument panel for approximately one minute, if the passenger's front airbag is activated. If this warning lamp comes on on the instrument panel, accompanied by an audible warning and a message on the multifunction screen, contact a CITROËN dealer to have the system checked. The airbags may no longer be triggered in the event of a serious impact. If this warning lamp fl ashes, contact a CITROËN dealer. The passenger's front airbag may no longer be triggered in the event of a serious impact. If at least one of the two airbag warning lamps come on continuously, do not install a child seat on the front passenger seat. Have the system checked by a CITROËN dealer. Sit in a normal upright position. Wear a correctly adjusted seat belt. Do not leave anything between the occupants and the airbags (a child, pet, object...). This could hamper the operation of the airbags or injure the occupants. All work on the airbag system is strictly forbidden unless it is carried out by qualifi ed personnel of the CITROËN network. Even if all of the precautions mentioned are observed, a risk of injury or of minor burns to the head, chest or arms when an airbag is triggered cannot be ruled out. The bag infl ates almost instantly (within a few milliseconds) then defl ates within the same time discharging the hot gas via openings provided for this purpose. Do not drive holding the steering wheel by its spokes or resting your hands on the centre part of the wheel. Passengers must not place their feet on the dashboard. If possible, do not smoke as deployment of the airbags can cause burns or the risk of injury from a cigarette or pipe. Never remove or pierce the steering wheel or hit it violently. Use only approved covers on the seats. These will not hinder infl ation of the side airbags. Consult a CITROËN dealer. Do not fi x or apply anything to the seat backs. 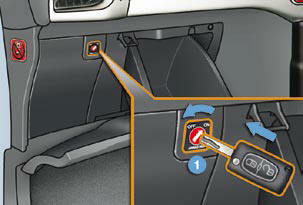 This could cause injury to the chest or arms if the side air bag is triggered. Do not fi x or apply anything to the roof. This could cause injury to the head if the curtain airbag is triggered. 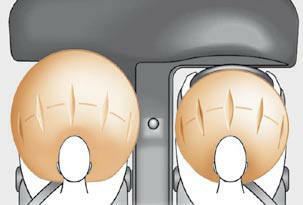 Do not remove the grab handles installed on the roof, they play a part in securing the curtain airbags.